Can city wastewater be reused for daily water demands? No problem with Lewabrane® reverse osmosis technology from LANXESS. How does it work? Semi-permeable membranes ensure contaminants like iron and manganese are filtered out of the water. Technologies like these are especially important in areas with a dry climate or with limited access to clean water. Making river water suitable for use in production is also possible with LANXESS technologies. We find one example in Pančevo, Serbia. Around 400 Lewabrane® membranes treat brackish water from the Danube for a refinery. Drawn around 15 km from Belgrade on the mouth of the Timiș River, the water is pre-treated in a water treatment plant, then treated in three reverse osmosis stage, each with 132 membrane elements. This provides 300 cubic meters of filtered Danube water per hour that the refinery can use for production. Transforming seawater into drinking water? In dry costal regions where drinking water is scarce, it is one way of accessing extractable water. One example: Lazorde Bay, located west of Alexandria, Egypt. Here, a water treatment system with 48 Lewabrane® membrane elements from LANXESS converts water from the Mediterranean Sea into water of potable quality. 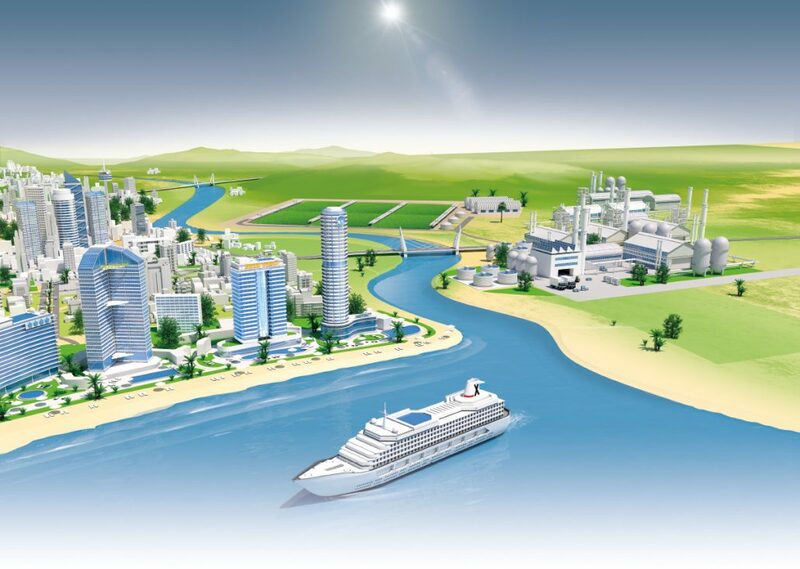 The space-saving technology can even be used at high sea, for instance for water treatment on cruise ships. 663 million people worldwide don’t have access to clean drinking water. A dire situation. And one that will continue to worsen in the future with global population growth, climate change and failing wells. Given this, efficient water treatment technologies are increasingly important. Whether used to generate drinking water or water for industrial production, or to treat and recycle wastewater. You, too, can help secure the water supply for humans, agriculture and industries. A pioneer in this sector, the specialty chemical company LANXESS has nearly 80 years of water treatment experience. Using your mouse, explore the interactive graphic, which celebrates World Water Day on March 22. In it you’ll discover LANXESS’s contribution to making water, a valuable resource, available worldwide. Our high-performance reverse osmosis technology Lewabrane® makes urban waste water usable again for the city’s water supply by removing harmful substances such as iron and manganese. Lewabrane® ensures that the water supply is safe and sustainable and thus makes an important contribution especially for regions with dry climates or limited access to pure water. Seawater can be desalinated to produce drinking water using Lewabrane® seawater RO membrane elements. Decarbonated, and therefore soft water can be easily and conveniently produced in household volumes using Lewatit® ion exchange resins. The iron oxide adsorber Bayoxide® E 33 has been developed specifically for the removal of arsenic from drinking water. of drinking and process water. Our treatment technology thus represents a new dimension of efficient and autonomous water supply. Industrial water treatment is the best-known and largest field of application for Lewabrane® RO membranes and Lewatit® ion exchange resins. In the power generation industry both technologies are often combined to produce boilerfeed water and steam to avoid incrustation and corrosion. The removal of toxic substances plays a key role in the treatment of industrial effluents. Lewabrane® can be used for general removal of critical compounds. Lewatit® ion exchange resins and Bayoxide® iron oxide adsorbers facilitate the selective removal of toxic heavy metals or organic pollutants from industrial waste water for a more sustainable production. Both Lewatit® and Lewabrane® can be used for the water treatment in food production. Sugar and corn syrup processing represented in former times the greatest resin volumes after water treatment. Today, food processing has set new challenging objectives such as cost reduction, health considerations, recovery of special products categorized as nutraceuticals, reduced costs of wastes disposal and better managing of byproducts. New applications have been developed, Lewatit® is e.g. used for sugar decolorisation, separation of glucose and fructose, deashing of gelatine or purification of organic acids in full compliance with relevant food-purity regulations. Lewabrane® membrane elements purify water by reverse osmosis (RO). The elements consist of spiral-wound, thin-film and high-crosslinked composite membranes, which have been specifically developed for the treatment of seawater, brackish water, and low-salinity water for the production of drinking and process water. Lewabrane® RO membrane elements are designed to provide stable, lower salinity permeate to minimize the load on the downstream ion exchange operations. and equipment. Furthermore, Lewatit® is also necessary for the production of pure and authentic-tasting foods and drinks. Bayoxide® E adsorbers are particularly developed for purification of potable, process and waste water. They are based on nanoparticular α-Ferric oxide hydroxide offering a very high surface area, advanced stability and superior adsorption capacity. Most important applications include the arsenic removal from potable and waste water or phosphate and silica removal from aquarium water. The design software LewaPlus® is a comprehensive tool for the planning of water treatment systems using reverse osmosis and ion exchange resins. It enables a combined system design with both Lewabrane® RO membrane elements and the reliableLewatit ® ion exchange resins – free of charge for our clients and tailor-made to meet their individual needs and requirements.